The idea of respecting parents and other elders is practically engraved into the minds of all children everywhere from a very young age. It is certainly important that they know to respect those around them, but it can be hard to put into practice when they are not being shown the respect they too deserve. Yes, deserve! Just as adults deserve politeness and deference, so do children. Respecting children not only shows them how to treat other people, but it also increases their confidence and self-esteem. Respect should be given out of love and not just as a result of an adult’s power. Punishments or bribes should never be the driving force behind obtaining your children’s respect. Each person has value, whether young or old, and respect should be extended in recognition of that value. Children deserve as much respect as adults because they are valued in the eyes of God. 1 Timothy 4:12 speaks of a message given to Timothy from his mentor, the Apostle Paul. It was about setting an example for those around him by his maturity of speech, conduct, love, faith and purity. Timothy was a young church leader at the time and his youth may have caused some in the church to deem him imprudent. That is why this message was so significant. While we cannot be completely clear as to what these people thought of Timothy, we do know that it was important for him to understand how God had called him to present himself as a dedicated follower of Christ and a leader. Children are to speak positive words into the lives of others, praise God, and express gratitude for their blessings. That positivity should also extend into their actions. Negative or curse words do not bring glory to God or establish that the person speaking them is mature. Volunteering for church events and following through on commitments are examples of the conduct of an exemplary child. The described ‘purity’ extends to spiritual purity as well as physical. Do they mean well in all their actions? Is their faith in God strong? The answer to these (and similar) questions should be “yes”. Just as Paul advised his protégé Timothy, God wants the same from your children. He wants them to know that regardless of their age, they are worthy of respect. Importantly, they are to carry themselves in a way that is pleasing unto Him and as they do so, they will gain more and more respect from those around them. Sometimes our children are harder on themselves than others are with them. It is important to listen to what your children say about themselves and be able to help them stop their self-criticism as soon as possible. Encourage them to build self-esteem. In her online article on Focus on the Family’s website, author Shana Schutte writes that there are basic ABCs to building self-esteem in children. Start with the letter “A” which represents “acceptance”. Children must feel accepted unconditionally by their parents! If they don’t, they will withdraw and become self-critical. The letter “B” represents “belonging”. Children must feel as if they belong in their family and are a critical, appreciated part of their family. When peer pressure takes place, a child who feels a deep sense of belonging to her family, will find it easier to resist doing an act that she knows is not right. The letter “C” represents “competence”. Your children also need to feel as if they are competent and able to do what they would like to do. Be there for them and encourage them, but do not be an overprotective parent. I also believe it is very important that children learn Bible verses that describe how much God loves them and how God sees them. Search for Bible verses that your children can memorize and then use these verses to refute any negative feelings your children may have about themselves. Among the skills parents should teach their children, problem solving is often overlooked. A person’s ability to solve problems quickly and effectively plays a huge part in the way he handles challenges, and ultimately, the path of his life. Providing children with the tools and experiences to be proficient problem solvers prepares them for the problems that will inevitably show up in their personal and professional lives. In her online article for the PBS website, “I Figured it Out!”: Helping Kids Become Tenacious Problem Solvers”, author Deborah Farmer Kris gives some expert advice in nurturing our children’s imagination and creativity. First and foremost, we must encourage our children’s curiosity. When they are young, children constantly are asking the question “Why?” Instead of reacting to this question as a burden, parents should enthusiastically respond “Let’s find out!” By responding in this manner, we show that their question is to be respected and that there are ways to find out answers. Second, Ms. Kris recommends that we do not give answers to a problem to our children right away or step in too quickly to resolve it. We should help them reframe or clarify the problem and search for answers. Ask such questions as “Have you tried this already?” or “Tell me more about the situation.” Help them to think about the challenge and come up with their own solutions. I’m a lawyer and law schools use the Socratic method to train students to think critically. A law professor always asks questions of the students, forcing them to think critically and search for the right arguments. Fourth, help your children to be good observers. Encourage them to look for clues or search around for material needed for a project. Spending time in nature is a good way to develop good observation skills as they can use their five senses. The Meriam-Webster dictionary defines “role model” as a person whose behavior is imitated by others. The entertainment media is constantly providing us with information about the so-called “stars” and role models - whether they are actors, musicians, singers, or other public figures. 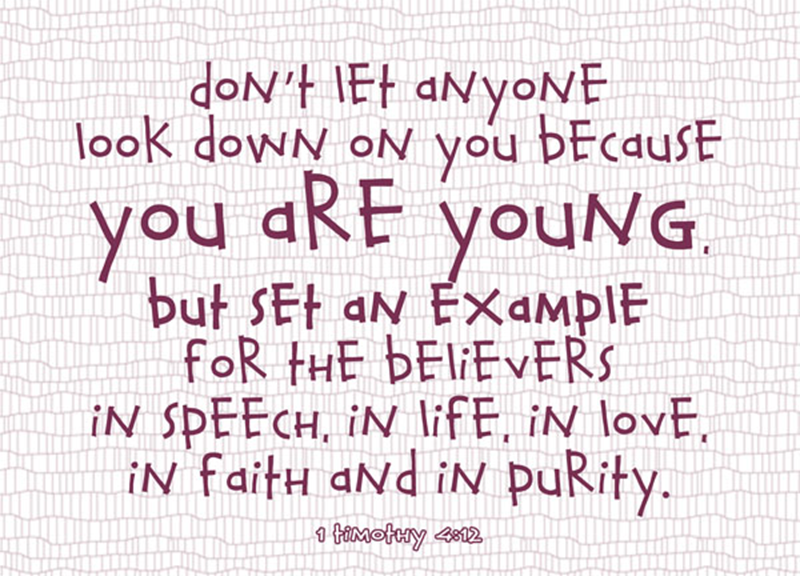 Often, we see children and youth emulating the dress and behavior of these “stars”. As Christians, we should have our own “stars” for our children – persons who are different, yet extraordinary role models. And, these “stars” must start at home. This week’s blog centers on the role models whom our children should have in their every-day lives. When I found this image for this week’s blog, I was very impressed and happy. It says a tremendous amount in very few words, and I encourage you to take your time to read it and talk about it with your spouse and other family members. Please set aside some time to do so. As people who are not Christians look to the world’s “stars” to give them inspiration for living, we Christians must choose a different standard – one that glorifies God. I have written before about boosting your child’s self-esteem, but today I will be discussing a few additional points as this is such an important subject. Self-esteem is simply how a child feels about himself. It is vital that children feel good about themselves because it makes them better problem solvers, better learners, and more appreciative of themselves and the people around them. Since self-esteem is so integral to a child’s development, here are a few things you can do to boost his confidence. 1. Do not pile on the praise. This may seem counterintuitive to what you believe. Simply praising your child for everything he does is not helpful. And, research shows that it may backfire. Concentrate on praising effort. Your praise may appear fake if a child knows that he did not perform well so instead, acknowledge when your child is making mistakes and encourage him to keep trying! 2. Let your child make mistakes. When teaching a child something new, be patient and monitor what she does. Then, let her do it on her own so that she can learn from her mistakes. Too often, as parents, we do not want our child to perform mediocrely. How can she learn if she does not keep trying to do better. 3. Encourage independence. Once your child knows the difference between right and wrong and understands the consequences that come with certain decisions, let her make some for herself. Often, this can show how much you trust her and respect her choices. 4. 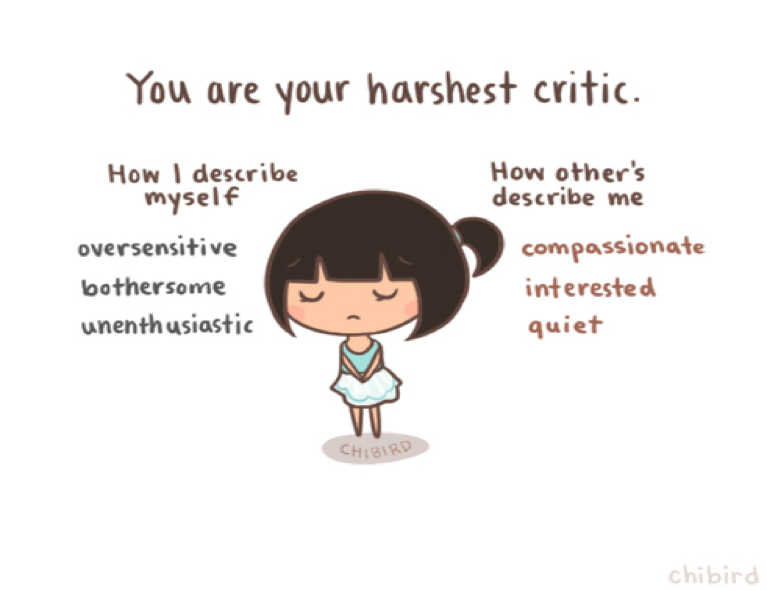 Do not give harsh criticism. I often hear parents calling their children names such as “lazy”, “messy”, “disorganized”, etc. What we speak over our children will come to pass. They will begin to think about themselves just as you described. So, select descriptive words that are encouraging rather than discouraging and look for things that they do right, rather than what they have done wrong. Though these steps may seem simple, following them will go a long way in building healthy self-esteem in your children. Kids Health provides more information about the benefits of high self-esteem in children and what you can do. Read the entire article by CLICKING HERE. It is exam season and your children might either be freaking out about it or blissfully oblivious as their exam dates get closer with each passing day. Regardless of their state of mind right now, exam season is always a stressful time. Parents can play a significant role in relieving some of that stress by assisting their children to prepare for their exams. Before beginning, parents must understand the type of learner their children are. Of course, each child is different. Is she a visual or hands-on learner? Is he a mix of both? Does she work better alone or in a group? How long is his attention span? Talk with each of them about it and come up with methods for exam preparations that are the most conducive to his learning style(s), not yours. Many parents, including me, assist their children before a test. Some use flashcards, others ask probing questions, while others make mock exams - the effectiveness of each technique is completely determined by each child’s learning style. I have written some tips in a couple of articles on this blog about spending time with your children and being involved when they do their homework, that can be applied to helping your children study for exams. The most important takeaways from these blogs should be scheduling, location and your overall involvement. Studying in a clear - somewhat secluded- area helps your children focus on their tasks without distraction. Planning a schedule to study for each class gives a sense of order during a time that may be chaotic for most students. Parents can assist by checking up on your children every once in a while to observe their progress or assist with a problem. This shows them that you care about their academics and it gives them the chance to share what they have learned. It also gives them the opportunity to ask questions on what they may not thoroughly understand yet. That is not all! According to an article on the U.S. Department of Education’s website, one of the best things you can do for your children is to talk to them about their exams. Find out what subjects they are confident and not-so confident in. Speak with them about the areas they think they need to focus on. Speak with their teachers and present these inquiries to them, too. Use your newfound data to help your children set up a study plan that strengthens their weaknesses and enhances their strengths. Be sure to confirm with their teachers the correct exam dates and ensure that they start studying well in advance. Children can get confused about dates, especially if they have not written them down. Also, having a longer time span for them to go over the information for each subject, gives your children a better chance of actually learning and comprehending the information rather than just memorizing it. Comprehension signifies that the information can be applied to many different situations; however, memorization makes it much harder to do so. Parents know what exam season is like. We all have been through it. We can use our experiences, along with these tips, to ensure that our children handle studying and taking exams better than we did and are more successful. You can find the U.S Department of Education’s article for more tips on how to help your children by clicking here. As parents, we are often consumed by preparing our children for the future. Whether it be enrolling them in as many extracurricular activities as possible to round out their academic resume or teaching them to be self-sufficient for adulthood, we want them to be completely prepared for everything that the future has to bring. All this focus on the future, though, can cause high levels of stress for both you and your children and make it very difficult to just bask in the here and now. God does not want us to be anxious about anything. 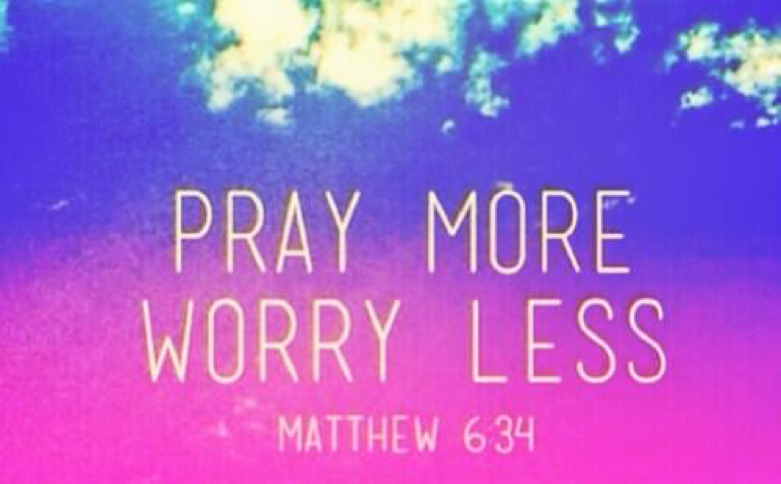 I like what the words on the image for this week’s blog say: “Pray more, worry less”. No one truly knows what the future will bring, but, as a Christian, you should feel comfort in knowing that God has already established a plan for the lives of each of your children. Understand that not every trait your child has now, will carry over into her future. For example, if you notice that your child is forgetful or seems unmotivated at times, it is unlikely that her attitude will persist throughout her life because behaviors change. Of course, you should talk to her about her conduct to ensure that she is fine and motivate her to do better, but do this to help your child in the present, not necessarily for the future. She does not need to hear your theories about the detrimental affects her present behavior may have on her future. She needs her parents’ assistance in dealing with whatever is going on at the moment. Spend time with your children (uninterrupted by the distractions of technology). This could be a planned outing or an impromptu hangout session. Making time for your children shows them how much you love and value them. Stop yourself from worrying. In Matthew 6:34, Jesus taught His disciples about concentrating on what is happening today, and not worrying about what may happen tomorrow. Pray. Daily, ask God for guidance and comfort. How Can Christian Parents Build Self-Esteem in Their Children? Although my quote for today’s blog is not from the Bible, I believe it to be nonetheless very appropriate about self-esteem. Just what is self-esteem? Essentially, it is the way a child thinks of himself/herself. As Christian parents, what can we do to build self-esteem in our children? We, of course, do not want them to grow up to be conceited and self-absorbed but there is a balance between healthy self-esteem and an inflated ego that we should understand. First, we need to know and fully appreciate how God sees us and there are a number of Bible verses that show us that God sees us as very special. For example, Genesis 1:27 says that “God created man in His own image, in the image of God He created him”. Psalm 139:14 says “(f)or You formed my inward parts; You knitted me together in my mother’s womb. I praise You, for I am fearfully and wonderfully made.” In Ephesians 2:10, we are described as “God’s masterpiece”. Since He created us as such valuable, superior beings, we should see ourselves that way. Second, it is important to make clear to our children that they should not rely on anyone’s praise from day to day to have self-esteem. We, as parents, may praise our children some days, but not on other days. Also, other people may not praise them, but in fact, may say negative things to them. Their self-esteem and confidence should derive from God, who is always consistent and loving, and not from humans. Help your children learn and memorize Bible verses that mention how special they are. It is the Word of God that will serve as the foundation of their confidence. Third, each child has different strengths. Focus on building those strengths. Remind them that all their gifts and strengths come from God. James 1:17 (“Every good and perfect gift is from above, coming down from the Father of the heavenly lights”).